The focus on ‘Responsible Investment’ strategies has increased significantly in recent years. Responsible investing is an approach that incorporates environmental, social and governance – or ‘ESG’ – factors into investment decisions. Governance has been long-seen as core to effective oversight and risk management. Today, environmental and social factors – most notably relating to climate change, energy, plastics and social responsibility – are recognised as increasingly important; and investors are putting them under significantly greater scrutiny than ever before. ESG investing is the overlaying of ESG risks and opportunities on top of the more traditional investment analysis process. ESG investment strategies are no longer seen as distinctly separate from traditional investment strategies; and ignoring ESG factors is seen as ignoring risks and opportunities that have the potential to materially impact financial performance and returns. Investors are now increasingly screening stocks in, as well as out of, their portfolios based on ESG criteria. This is no longer a ‘trend’ and data shows that an increased focus on ESG factors pays off. The shift in focus on ESG factors, from the margin to the mainstream, is also having an increasingly important influence on stakeholder engagement by companies and their disclosure to the markets. Companies are now attracting investment for scoring highly on ESG – as against being applied to exclude companies – and with a consequent positive impact on asset prices. 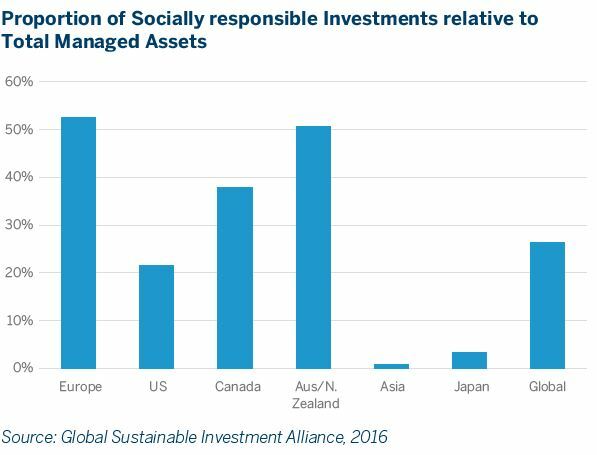 The UK’s Investment Association, a representative body for 200 UK investment managers managing almost £8 trillion, highlighted in its mostrecent asset manager survey the increasing emphasis on responsible and sustainable investment. The Investment Association outlined that while ‘negative screening’ (meaning stocks are excluded rather than included based on ESG criteria) dominates dedicated ‘responsible’ investment strategies, asset managers are now increasingly incorporating ESG criteria into their mainstream investment strategies and their decision-making. Sustainable or socially responsible investment has been purported to exist for 200 years in the guise of the money management practices of the Methodists. However, the first socially responsible investment portfolio is believed to have been created for the Church of England in the late 1950s by CCLA which continues to manage £8 billion of assets today. The initial basis of this and subsequent portfolios was largely driven by religious and ethical values; and was based on a simple methodology – the avoidance of sectors such as alcohol, tobacco and gambling. This style of investment was ‘negative screening’ where companies are actively de-selected based on specific criteria. As the asset management industry advanced, and in particular, following the formation of the UN Global Compact in 2005, the concept of ESG investment began to take shape. Over the past 20 years, this has proliferated a series of organisations and bodies promoting responsible investment – such as the UN’s PRI and its Sustainable Development Goals (SDGs). Now major global asset managers, including Norges, the Norwegian (and world’s largest) sovereign wealth fund, and Blackrock, the world’s largest asset manager, among others, are actively pushing companies to recognise the importance of their climate impact; the importance of effective governance and oversight; the importance of corporate culture on performance and risk management; and the social impact of a business on all its stakeholders. The UK’s FRC, author of the Corporate Governance Code for companies and the Stewardship Code and mandate signatories to demonstrate how they take into account material ESG factors, including climate change, in their investment approach. Investors increasingly want to assess the risk associated with their investment including the impact of climate change and associated regulation– a reflection on the society in which we now live. Certain industries are naturally more exposed to the ‘E’ in ESG and investors are now taking action. For example, some of the world’s leading fund managers, led by Norges, have recently decided to reduce or cut investments in coal-related businesses. This is not new for Norges which has previously published guidelines for its investors on issues including children’s rights, water management, human rights, tax and transparency, anti-corruption and ocean sustainability. Companies will be aware of the well documented annual missive from Larry Fink at Blackrock which most recently focused on corporate purpose. State Street, the world’s third largest asset manager, also wrote to over 1,000 companies this year outlining the importance of corporate culture – noting a study from Global Intangible Finance Tracker that “revealed that 52% of the world’s business value is intangible and 80% of that is totally undisclosed.” And it’s not confined to equities. As mentioned above, a range of analyses show that higher rated ESG companies benefit from tighter credit spreads and the credit rating agencies are also integrating ESG reporting into their rating frameworks. Regulators also continue to raise the bar on ESG reporting. In early March, the EU set out new regulations which will require asset managers to disclose how they are integrating ESG factors – and how they adhere to ESG objectives – in their investment decisions. Their stated aim is to lay the “foundation…which puts ESG onsiderations at the heart of the financial system to help transform Europe’s economy into a greener, more resilient and circular system.” Aimed at preventing asset managers from making “unsubstantiated or misleading claims” about the funds they sell – often referred to as ‘greenwashing’ – the disclosure requirements will ultimately enhance transparency; and, over-time also drive harmonisation of disclosure across different markets and business sectors. The read-through for companies is that as investors are placed under greater pressure, the scrutiny of their investee companies will also increase. It’s clear the ESG demands from investors are growing and here to stay. Over time, reporting requirements around ESG will become more onerous and become increasingly central to both a company’s investment case and their interaction with the market. It may take some years before the rise in ESG is fully incorporated into the investment landscape but its recent rise represents a demonstrable shift in reporting. What are the near-term implications for companies – those listed or with public debt? Institutional investor feedback is that a credible first step for companies is to identify how they are performing relative to the UN’s SDGs. With only 40% of companies using the SDGs as a benchmark, companies have a long way to go. Outside of the SDGs, there are a range of reporting criteria employed by different investors and organisations. The Sustainability Accounting Standards Board has issued different criteria and guidelines for 77 company sectors which are also a useful guide. Our experience of working with companies on the ‘G’ in ESG – Governance – tells us that companies are often doing far more than they effectively disclose publicly. Enhancing disclosure and engagement with shareholders on governance can be – and often is – the difference in ensuring strong support for AGM resolutions. In that way, it is a central tenet of protecting a company’s reputation – a form of invisible capital that can protect firms in times of disruption. Companies need to better disclose the actions they are taking while also identifying those that they are not. ESG disclosure needs to evolve – not just in the Annual Report – but in routine communications with the market. A February 2019 paper on ESG reporting by Ceres, a US sustainability non-profit organisation, highlighted that “too many companies fail to present sustainability as a core component of business strategy, decision making and revenue growth.” The gap between investor expectations and company actions has never been as pronounced. In terms of those who engage in ESG Reporting, while the ‘E’ and ‘G’ present challenges, it is the ‘S’ where companies struggle most. The Economist noted in 2017 that the complexity of the ‘E and G’ “pales in comparison with that involved in exploring what lies behind the ‘S’ for social.” S is, in its most general terms, linked with employee rights and welfare. Notable recent ‘failures’ on the social element of ESG have been cited as Sports Direct and Uber. Engaging with employees – and then calibrating and disclosing that engagement to investors – represents a first step towards meaningful disclosure on social factors. ESG factors are taking their place as a central and more relevant part of company disclosure and that is going to continue to evolve. This shift is driven by market demands together with a perception – or perhaps more accurately, an acceptance – that ignoring or paying ‘lip-service’ to ESG issues exposes both companies and investors to greater risk. It is clear companies are beginning to recognise the value creation potential of achieving higher ESG standards; and driving better disclosure. 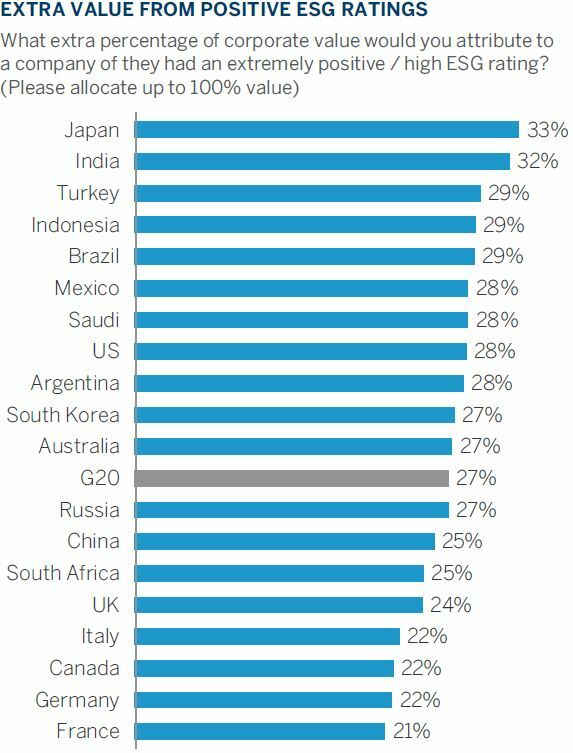 2018 research by FTI Consulting shows that C-suite executives, from over 2,200 companies in the G20 countries, believe that a company with a high ESG score could enhance its value by almost 30%. Will ESG supersede financial performance as the primary driver of investment decisions and valuations? No, but expectations on reporting are getting higher and ESG may well be the incremental difference in whether a company out-performs its peers or continues to trade at a relative discount.